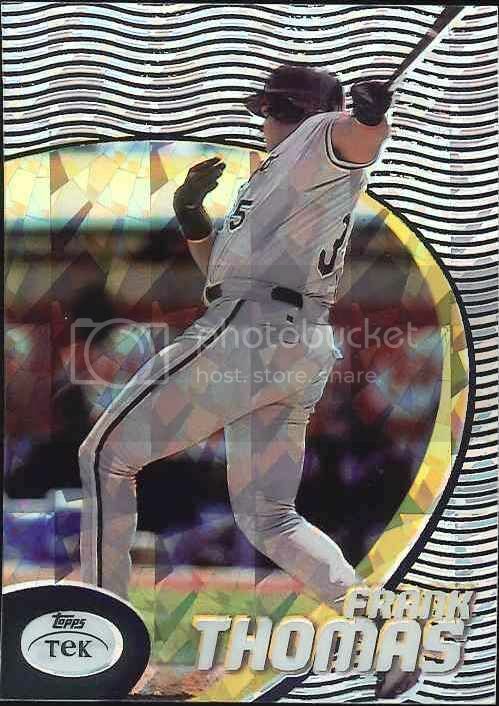 This thread is for anything 1998 Topps Tek. Scans, discussions, bragging, transactions, market activity, anecdotes, steals, etc. I remember back when 1998 Tek came out. I was at a show and bought a few packs. I didn't get it. The gimmick wasn't working for me and I think I was in the majority at the time. In fact, it was one of the first times that I thought things were getting a little too ridiculous with the hobby. 90 different base cards of each player and the photo was the same. Only the usually boring background doodle, many of which looked like they came from grade school art class, was different. Had I pulled any Diffractors? Who knew? They weren't marked and I didn't understand how to tell. Besides, at 1:6 packs they aren't exactly rare, right? I was grateful at the time... grateful that my guy, Rusty Greer, did not appear in the set. I felt like I was drowning as it was. I left the hobby in 2000 and came back in 2010. I don't feel the immediacy I felt back then to finish collecting projects. I actually enjoy the long-term project. 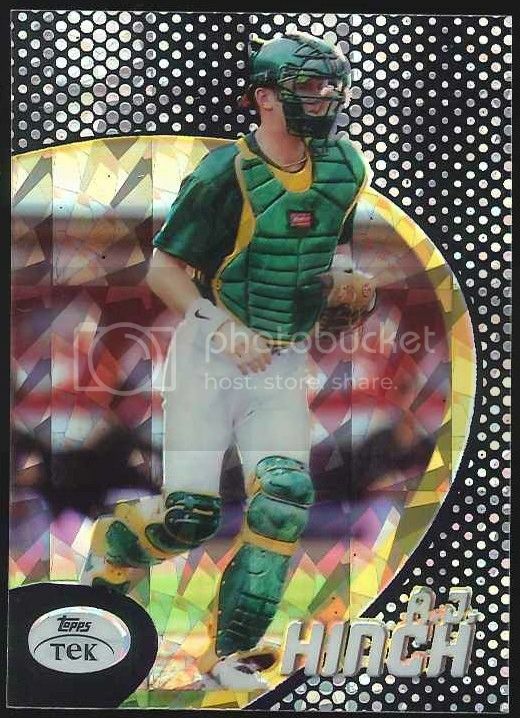 And now, I have a much different view of 1998 Topps Tek. Collecting them 14 years after their release is a very leisurely project. I'm working on collecting all of Jay Buhner's base and I don't feel any pressure to pick them up as soon as I find them. If the price ain't right I can just let them sit. But what really interests me now are Diffractors. They are almost an enigma. Why are these cards somewhat rare when they should be so plentiful? Even if the print run is really low - like, say, 10 each per pattern, that's still 900 total Diffractors that should be out there somewhere for EACH player. If there are 900 (just an example) for each player, then why is it that in the last year and a half that I've been paying attention are there some players that I've only seen a couple, or just one, or sometimes even zero of their Diffractors for sale? So, why are Diffractors tough to come by? One explanation that I've already alluded to is that they weren't super popular. But they weren't exactly duds either. I bet there were a ton of people that were like me and were intrigued enough that they bought a box, or at least a handful of packs, to try them out. I don't get the sense that they were gathering dust on LCS shelves everywhere like some other issues. Unopened boxes of them can still be found - they pop up occasionally on ebay, although the price seems to be going up. Let's say that most of the 1998 Tek product is open. Why are Diffractors not hitting the market? As you can tell from many ebay listings, the reason is that this product still confuses collectors. Sellers are not calling Diffractors by name in their listings, and in some cases, they are calling base cards Diffractors. Diffractors don't really look that much different than the base if you don't know what you're looking for. They aren't marked "Diffractor" like Topps Chrome Refractors, for example. They aren't serial numbered like 1999 Tek Golds. So many of these Diffractors may be stashed in closets and dime boxes somewhere, but people don't even know they have them. Needless to say, now I am very disappointed that Rusty wasn't in the set. Jay Buhner will have to do. I'll end this post with the cheapest Diffractor I've found to date - $1.74 dlvd. One of the duds in the set. Someday I hope to find one in a quarter box at a show just so I can say I've done it. So what's a fair price for a box? Assuming that you are going for certain players and that you want to piece the rest out... well, let's do some math. So how much do Diffractors go for on ebay? 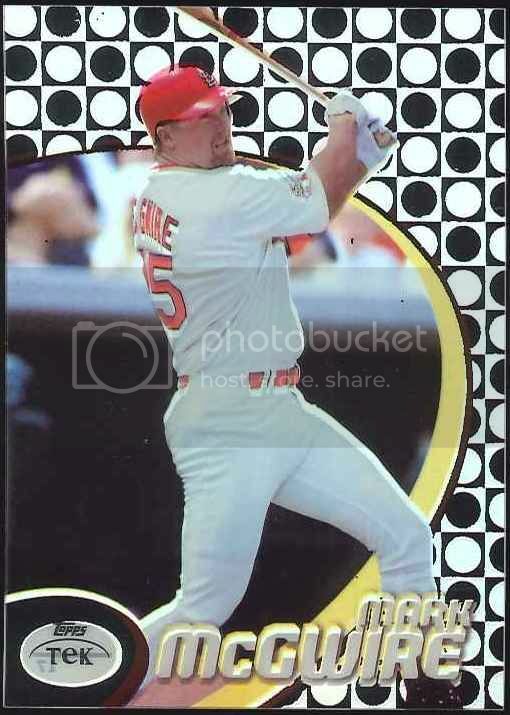 Anywhere from $1.61 (Ellis Burks) to $65 (Mark McGwire), if you look at ended listings right now. And that's really about right from what I've been able to tell. But the market is really hard to judge. While that McGwire sold for $65, most Griffeys over the past year and a half have gone for $30-$40. Two Greg Maddux Diffractors went for about $22 each in auctions, but one sold for $45 on a BIN. 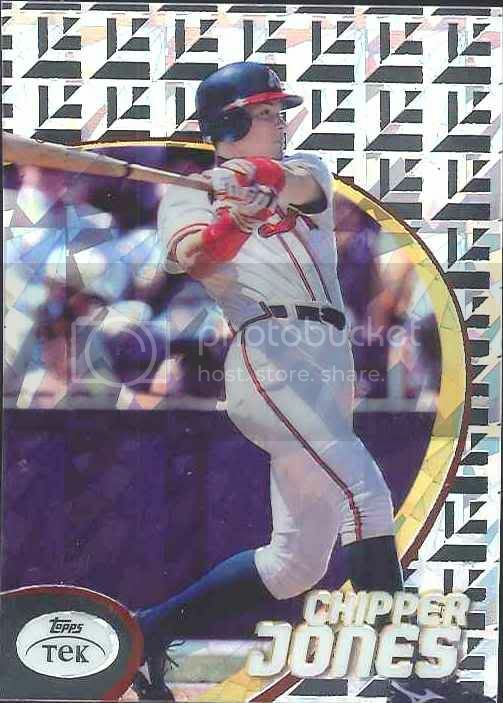 Andres Galarraga sells for $5.51, while Travis Lee sells for $25. How does base sell? Apart from a few players, it seems like lots sell better than singles. I think that if I were to open a box, I might try to sell what I don't want in one big lot. Not only easier, but it might make more money. Some base singles that sell well for about $5 each are Jeter, Ripken, Griffey, and oddly Edgar Martinez. I'm not sure why lots sell better. Maybe the buyer thinks they will make money by piecing it out or maybe they are going for a master set or something. But cards that you might expect to sell well, like Bonds, Frank, Juan, etc., are sometimes lucky to get a $1 bid. The going rate for unopened boxes is $160 according to the most recent ebay sales. I think I'll stick with buying singles for now. 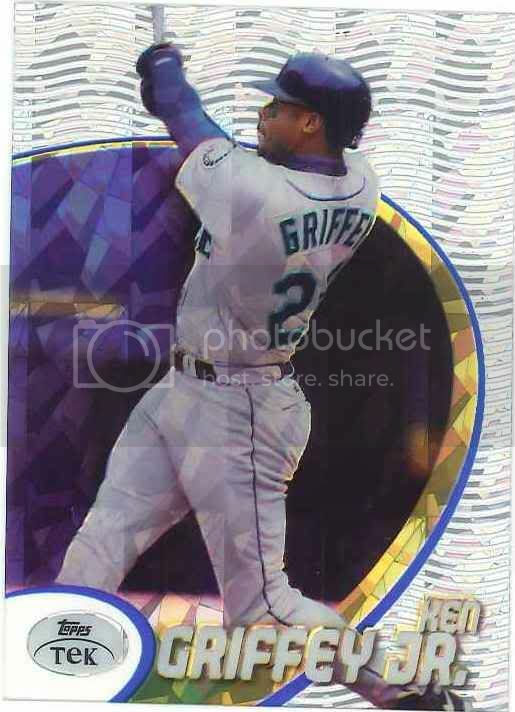 I'd much rather have four Griffey Diffractors than gamble on a box. I guess the problem there is being patient enough to wait for the Griffeys to hit. Last edited by RustyGreerFan; 08-09-2012 at 08:45 PM. So how much should a "set" sell for? Good question. Assuming we are okay with the idea that one card of 1-90 equals a set, what is a fair price? Recently a seller put up three sets on ebay for $40 each or best offer, and all three sold for $40 that night. That seems like a way better deal than $160 for a box - heck, you even get more cards than in a box. And of course you always have that hope... that hope that the person putting the set together couldn't recognize a Diffractor from base. Who knows how many Diffractors could be inside? What about a "set" of a particular player? The only one I've seen was just recently. 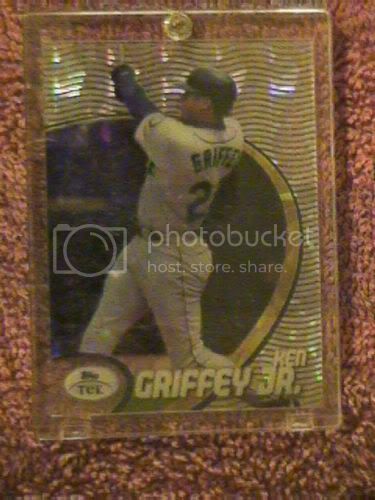 The seller listed a complete set of Griffey for $799 or best offer. It sold for $380. That's still a pretty good haul by the seller. $4.22 per Griffey ain't bad. How close does Beckett come to accurately pricing Diffractors? From what I can tell, they aren't close at all. Jeff Bagwell books at $15, but you can sell them for $50 on ebay. Where this can work in your favor is when sellers are going by Beckett instead of market. I picked this Frank up for high Beckett ($15). Yes, please. COMC can be fun because they provide the book value and you can make offers. When this hit for high book at $15 I offered $7.50. So happy he took it! I'm like you in that upon release, I was incredulous that there were 180 variations for each player. I thought that was total insanity. But in later years the set grew on me. About 2001, I found two boxes of it sitting in a local Walgreens. I ended up buying all the packs over the course of a couple months. It really is a great player collector challenge for anyone with a player in the set. The diffractors are so tough... I've had a much harder time finding them than the 99 Tek Golds #/10. One thing I've always thought would be fun in a thread like this would be to give each pattern a name. Like Pattern 1 looks to me like "Bullets in Glass." And this very interesting Tek printing error. Last edited by gracecollector; 08-09-2012 at 09:17 PM. I'm waiting to stumble upon a dime box at a show loaded with Tek. Every Tek I see for a dime I grab, if not for me, to try and help out someone else who's stuck collecting these. I'm still on 0 PC Diffractors, and probably always will be, unless some dealers go into their decade-plus old backstock and start selling out the stuff they though was junk. Wow, that is really interesting! I had no idea Tek went retail. That probably explains some things about rarity. How much were you shelling out a pack in 2001? Ha! Great idea on naming the patterns. Pattern #1 reminds me of the old Spiderman cartoon. Like a really half-assed way of drawing a spiderweb shooting out of Spiderman's wrists or billowing smoke. Cool error - never seen anything like that in 1998 Tek before. No way - the way you scour COMC you'll definitely hit one soon, no problem. Most sellers have no idea and price them based on Beckett. You collect so many guys you're bound to hit one. Best I've done at a show is get a base Griffey and Frank for 50 cents each. I wish it was that easy! The one PC Diffractor I've found, a Palmeiro, was gone before I could even think about buying it. The two that I've bought were non-PC guys I bought cheap; one I sold, and the second was a Salmon I mistakenly included in my port sale on COMC the other day. The only Larkin diffractor I have seen this year was on Ebay and it sold for $30+ if I remember correctly. I think most people would say that I have a pretty extensive Larkin collection and I have exactly ZERO diffractors of him. I have offered $30 for any Larkin diffractor in many threads over the years and have never gotten one response. These things are impossible to find! It makes you wonder if there were even 10 of each. I have had a very hard time finding even the base patterns. I still need like 30 different base patterns. And it would be a lot more if Togaman hadn't sold me a lot of 20 earlier this year. Togaman helped me too. I bought a bunch of Buhners from him. I also bought his Edgars then sold them for $5 each to a guy on ebay that had bought one from me before for $5. He was still willing to pay $5 each! Made my money back. My largest PC collection is Troy Glaus, well over 1000 by this point. He has a RC in 1998 Tek, so that's 90 base and 90 Diffractors, a ton of cards that will never show up. Someone, someday, is gonna stumble upon a 5000 count box, stuffed in some dealer's back room, that is filled with Tek, base and diffractors. Whoever that guy is, as long as he's willing to help out other collectors, will be a hero. 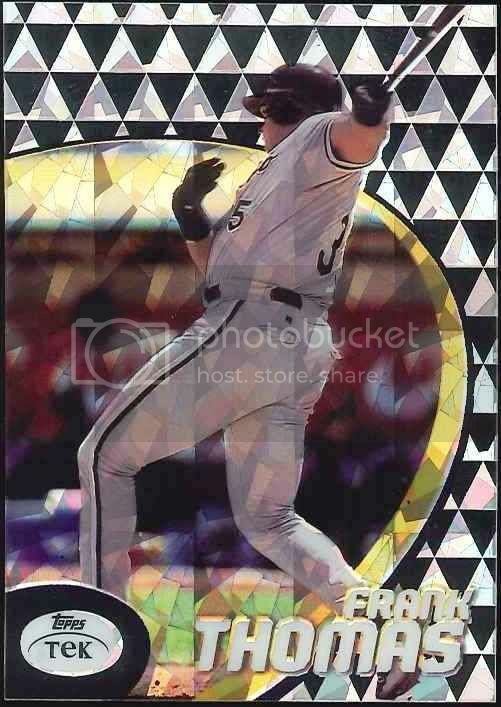 I can't even finish my Caminiti set. That should tell you some thing. A lot hiding out there. As for boxes, I've purchased two boxes in the recent past. One was a part box of approx. 8-12 packs and another was a sealed full box. I lost my teeth on the part box and looking back that was a stupid idea to buy but I had the itch... I made out great on the full box but I got lucky on the diffractors, pullign a McGwire, Belle, Cami, and two others. I feel like diffractors have less than 10 copies of each pattern, probably closer to 5 copies of each IMO or less. As for cards "hiding", I would agree. They are "base" cards to the average collector or person who collected back in the '90s and wants to just unload their collection piece by piece, the tek cards will get overlooked. As for full sets going up for sale, for a player collector that'd be HUGE. Not sure what I'd pay for all 90 patterns of Belle, or if I'd pull the plug.